In 2013, it was reported that Madison, Wisconsin was one of the safest cities in the United States. In the FBI reports that help dictate the “safest cities” and “dangerous cities” lists, statistics on shootings, homicides, burglaries, rapes, assaults, and other various violent crime statistics are taken into consideration. Interest in these numbers typically stem from an attempt to understand the probability of such a crime to occur, given a set of unknown circumstances. For instance if a shooting occurs on Allied Drive in Madison, was the shooting an domestic heat of the moment instance, a premeditated attack, related to drugs, random spree of violence, or something else. A standard way to represent these numbers are to use a rate of occurrence. Rates can occur in either density measurements, such as number of occurrences against the average number of persons in the area, or as normalized numbers, such as number of occurrences against the number of residents; these are the per 100,000 numbers we see in many reports. The latter method is what is used in the Morgan Quitno “Safest” and “Most Dangerous” cities lists. This methodology is well know to be flawed as several locations have lighter densities of population but large populations tend to have higher rates. This is the phenomena associated with cities such as Houston, Texas and Jacksonville, Florida. Instead of reporting rates and attempting to compare cities based on fractions of counts, we can consider a different type of method for measuring crime in cities. Reporting numbers is helpful, but why not identify probability distributions over cities. To give an example, the city of Madison reported (via SpotCrime) 115 shootings over the three year period of 2008 – 2010. Given an approximate population of 230,000 persons, this breaks down a “rate” of 16 shootings per 100,000 persons per year. 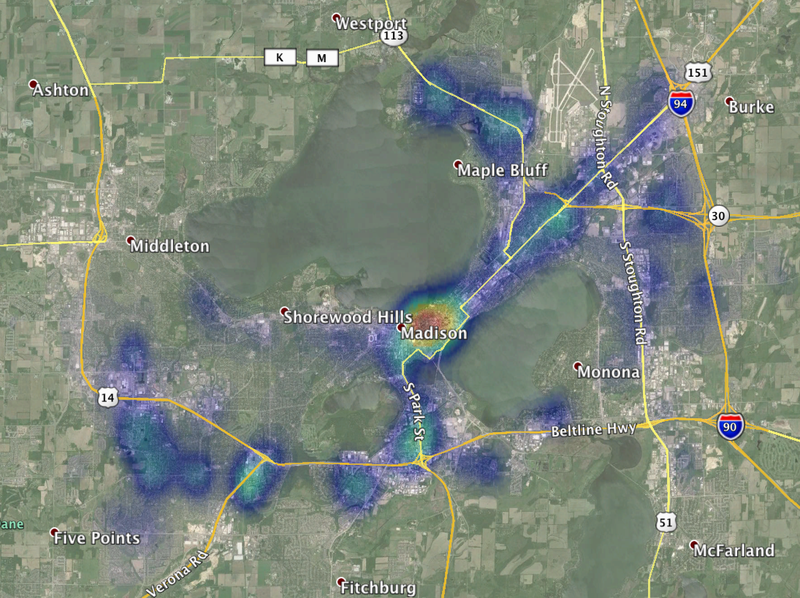 If these shootings occur in a uniform distribution across Madison, this is a reliable number. But where are all the shootings occurring? Distribution of Shootings in Madison, WI between 2008 and 2010. Obtaining the open data records from SpotCrime, we are able to build a kernel density estimator of the distribution of shootings in Madison, WI. We immediately see that there are three primary locations for shootings to occur: one location around Allied Drive region near Verona Road, and two locations found in the triangular region of Park St and Fish Hatchery Road. Both areas have been known for violence over the years. 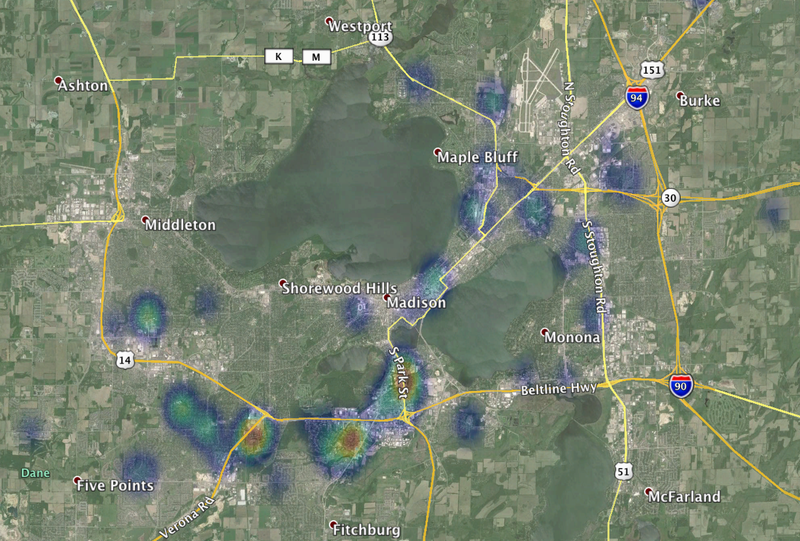 These area represents only approximately 1.6 square miles of Madison’s 84.7 square miles of coverage. That is, the bulk of the 36 shootings per year are occurring in less than 2% of the city. This identifies that if shooting events are random in Madison, the highest probabilities are located in these three regions. The other events (spurious blue events) may be possibly described by isolated events, such as a former classmate’s 2001 shooting in a Kohl’s grocery store parking lot. 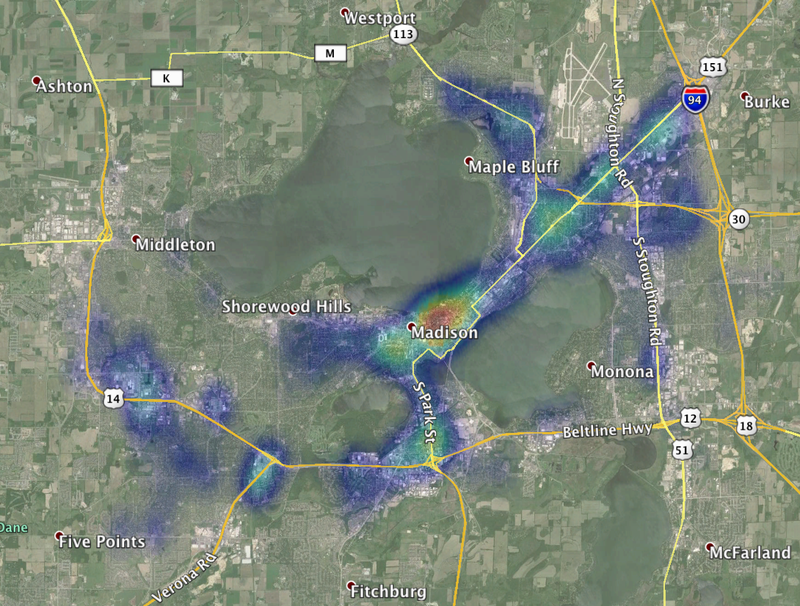 The question here is whether these are really the “bad” regions of Madison. We can take a look at assaults, which is also considered a violent crime in FBI reporting statistics. During the similar three year period of time, it was reported via SpotCrime’s open data reporting, there were 5,380 reports of assaults. This translates to approximately 780 assaults per 100,000 persons per year. Again, we ask where the crimes are located. This gives a better indication as to where assaults really occur. Distribution of Assaults in Madison, WI between 2008 and 2010. We find that the original three locations are hot spots, but the highest density of assaults occur on the northwest side of the Madison isthmus, primarily along State Street and into the Broom Street / Johnston Street area. This being a heavy bar/tourist region associated with nearby UW-Madison and the capitol, there tends to be a heavier police presence combined with a tendency for other testy elements that can result in immediate action in case an assault occurs. We also find a couple other locations that have a higher than average rate of assaults in the city: Warner Park region (north Madison), the Aberg/Route 30 region (east Madison), and the McKenna Road region (southwest Madison). 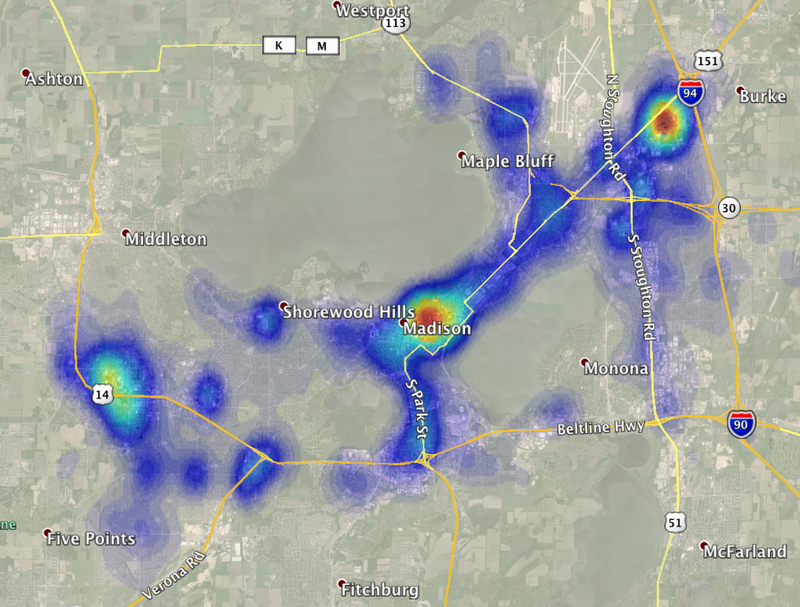 We can perform the same type of calculations in mapping burglaries in Madison. Distribution of Burglaries in Madison, WI between 2008 and 2010. The majority of burglaries occur primarily about the isthmus and into the west region around Regent Street. During these three years, there were 3,127 reported burglaries; a rate of 453 per 100,000 per year. The rate is much lower than the rate of assaults, but they occur relatively in the same region. In fact, the Allied Drive region rarely experiences burglaries compared to other regions. The primary route of burglaries extend from Regent Street through the capitol region and up East Washington Blvd out to Aberg Ave. Recalling that burglary is the unlawful entry of a property with the intent to commit another crime, we can take a look at that common crime: Theft. Distribution of Thefts in Madison, WI between 2008 and 2010. The city of Madison, WI was selected for two reasons: the openness of data made available by the Madison Police Department through SpotCrime, and this was the city I lived in during high school. Those from Madison would certainly recognize the theft map immediately. All three hot spots are located at large retail centers. The location at the isthmus is centered about State Street and the capitol, a heavy tourist destination and a place where kids traverse; sometimes completely parent free. 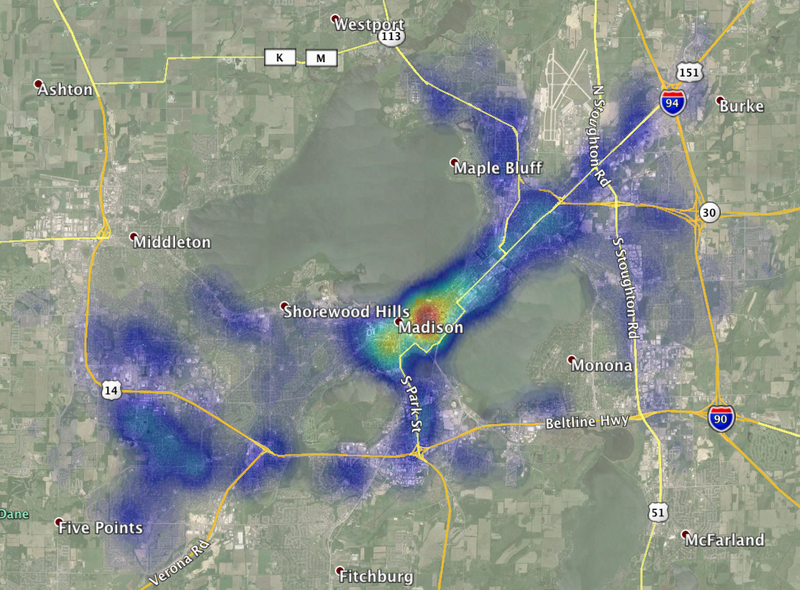 The large hot spot in northeast Madison is the East Towne Mall region. The third largest hot spot is located in southwest Madison at the West Towne Mall. The small reach across highway 14 is the reach into Wal-Mart and the small surrounding shops. As expected, the rate of thefts are highest at retail locations. Distribution of Robberies in Madison, WI between 2008 and 2010. The distribution of the 1,135 reported robberies shows a cross between the maps reported for shootings and assaults, and the maps reported for thefts. The hottest spot is again around the isthmus; but the shooting hot spots of Allied Drive and Park Street, as well as the theft/burglary areas of Aberg, East Towne, and West Towne malls maintain a higher than average (for Madison) rate of robberies. These maps tell us several things about the city of Madison, WI. We can easily identify the locations where shootings most likely occur and identify that thefts primarily occur at retail locations. The tourist locations about the isthmus are prime for theft, assaults and robberies. All commonly generic types of things we hear about various cities in the United States. However, mapping goes beyond that. If we believe that crime is uniformly distributed, then the rates are simply good enough to report. These maps prove that crime is not uniform about Madison. In fact, we see that violent crime encompasses less than 5% of the entire city. So how do we utilize maps in a better capacity? We can use the available data reported by police departments and companies such as SpotCrime to identify where crime occurs and build a probabilistic nature as to where crimes occur. Most crimes are not random, therefore identifying where crimes are committed helps us understand how to prevent similar actions to occur to our persons when traveling to those regions. It also serves as a guide as to help keep vigilance when we travel to those areas and identify why police forces are distributed about a city. There will always be a police presence on State Street. However they are primarily there to help keep order for assaults, thefts, and robberies. It just takes knowledge of your surroundings, and these types of maps are helpful for this type of understanding. That’s all I currently have for the city of Madison, WI. What city would you like to see crime distributions for?